On the list of "best jobs on Earth", this is right up there with professional elephant dresser: a dude at Cabot Creamery in Vermont has called his position -- essentially -- a "cheese babysitter". All day, he keeps track of their cheddar varieties and samples them all for taste, smell, and consistency. And he doesn't even need to tuck them in at night. Craig Gile's official job title is "cheese grader", which means he (or another grader) tries every one of their cheddars (via samples taken out of their cores) to determine whether they're mild, sharp, extra sharp, or something else entirely. Cabot officially works with 1,200 farmers and produces 137 million pounds of cheese annually, so he's got his work cut out for him. Maybe he could use some more help? "I do really think of them as having their own personalities,” says Gile, who has a degree in psychology. 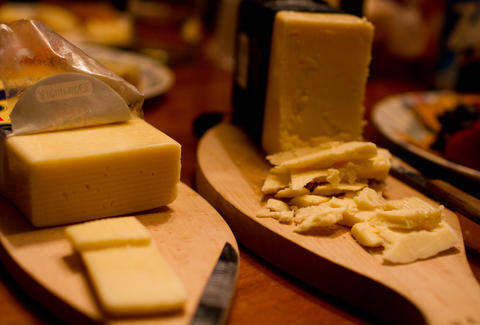 He occasionally eats up to 200 bites of cheese in a single day, a fact that makes us whey jealous. Adam Lapetina is a Food/Drink staff writer for Thrillist, and has a standing offer to babysit his coworkers' cheese. Nobody has taken him up on it yet. Read his musings at @adamlapetina.